Looking for a new suit? Not sure what to invest in? We’ve all been there and when it comes to men’s suits there are so many options to choose from it can be overwhelming. Let us break it down and shed some light on the top 5 timeless styles that you will never go wrong with. We will also give you a little insight as to what to wear with that suit, and what type of man that suit fits best if necessary. The best part of this entire list is the fact you can design each of the below styles on our site. Shop and design from nearly 300 fabric options of men’s custom suits. *If you have any of the below styles already, we suggest combining the styles. For example; you may have a navy suit but not a navy three piece suit, or you may have a plaid suit, but not a double breasted plaid suit. Let’s get started on iTailor’s list of men’s suits with timeless style. Number five on our list of top 5 men’s suits with timeless style is The 2 Button Charcoal Suit. There are only so many places and events the men’s classic black suit is proper for. Adding this to your closet of men’s suits and style repertoire will allow you to mix this with a multitude custom dress shirts, ties, and more. This suit doesn’t really work best for any specific type but more so every man. We recommend wearing this with solid and patterned dress shirts, just be careful not to add patterned ties with patterned shirts. Number four on our list of top 5 men’s suits with timeless style is the plaid suit. Plaid suits you don’t always see every day which is precisely why you want in on this bad boy. It’s unique, memorable, and helps you stand out. The good thing about plaid suits is they are year round favorites. You can always find brighter patterns for the warmer months and darker ones for the colder months. 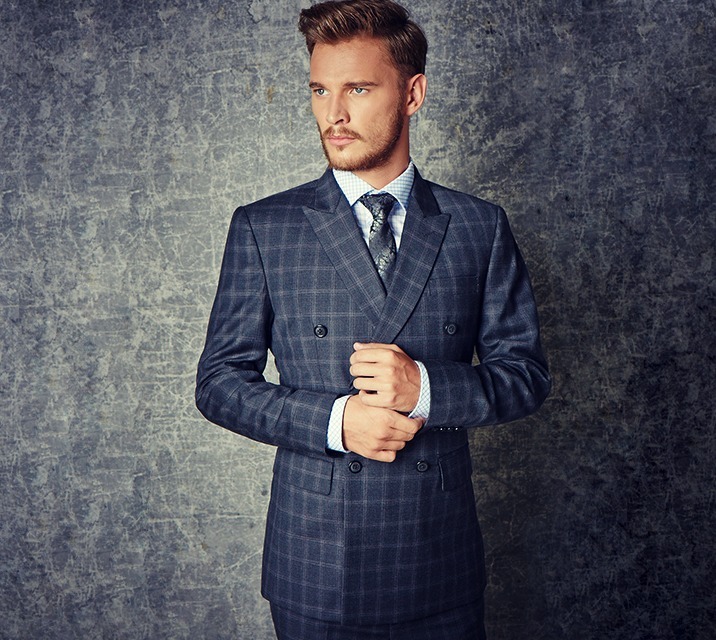 See our plaid collection of men’s suits today. Since the suit pattern on plaid suits are usually quite busy we recommend keeping your custom dress shirts solid, and be certain your tie patterns complement this suit properly. Number three on our list of top 5 men’s suits with timeless style is the double breasted suit. This absolutely ageless sensation has been around for longer than both you and I have been alive. But at any rate it has seen peaks and valleys of being “in-fashion”; the good thing is it doesn’t seem to ever go away which tells us it’s a surefire winner no matter what your age. This suit is ideal for taller and more slender or physically fit men. We recommend for a more modern appeal on this timeless piece to make certain this investment is a custom made suit, you want this as form fitting and slim as possible. One note that we must state is that you never are to wear the jacket unbuttoned, so take note. When it comes to pairings, we suggest wearing solid custom dress shirts and solid ties with this masterpiece of men’s suits. Number two on our list of top 5 men’s suits with timeless style is the three piece suit. 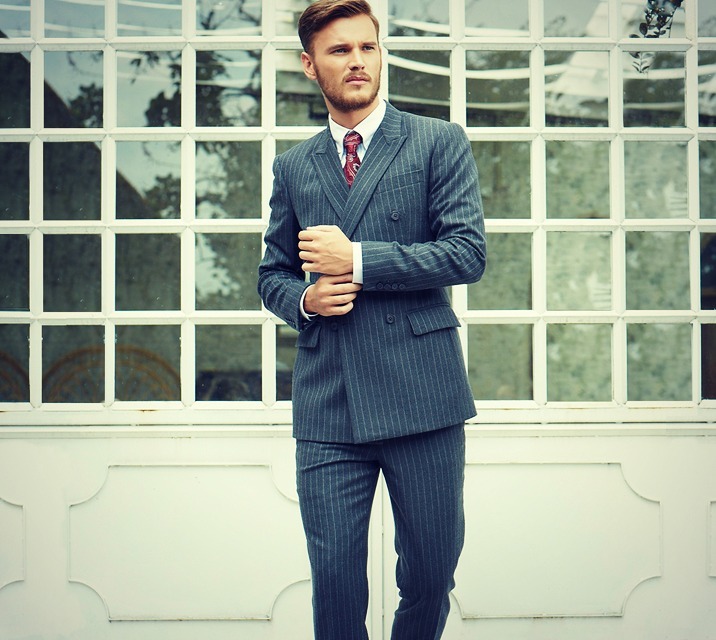 What can we say about the three piece suit, it’s dapper sophistication, it’s stand-alone style that won’t age, it’s on every style guide imaginable that pertains to men’s suits. It allows you to layer in the colder months, and keep a custom tailored appearance when your jacket is off as well. Our favorite aspect to the three piece suit is the vest/waistcoat does not always have to match the suit fabric, as long as it’s a complementing color you can find in the suit we say go for it. Your custom dress shirts can be patterned or solids, same goes for your ties just be careful on your patterns, be sure they complement, not clash. 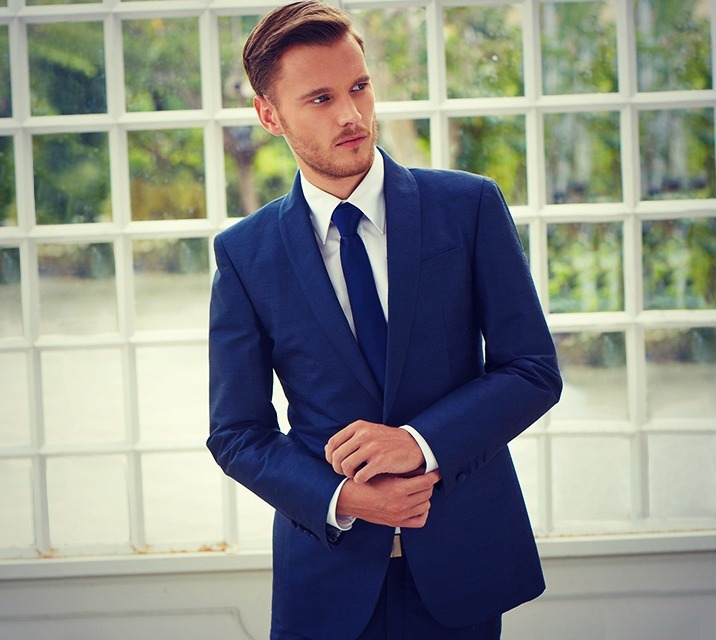 Number one on our list of top 5 men’s suits with timeless style is the navy blue suit. Whether you opt for Single Button, or Two Button, this suit simply can be worn to just about anything, anytime, for any reason, all year round. Think, weddings, work, dates, etc. It can be easily paired with a plethora of custom dress shirt options (solids and patterns alike), and the same applies to ties. You can also wear this suit jacket with your favorite denim. It works well for all types of men and is always going on sale. Keep these men’s suits in mind on your current quest for your next men’s custom suit. Also, remember it’s always beneficial to invest in style that will stay in style for years to come. For an even deeper look at timeless style see what GQ has to say and click here. That’s it for this week, if you liked what you read or have any questions please feel free to let us know and comment below! If you’d like to design your own custom suit from nearly 300 fabric options click here and start designing your men’s custom suits today! 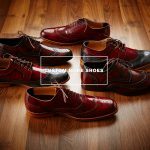 Don’t forget to subscribe to our newsletter below for free company updates and our weekly sales on men’s custom suits, shirts, luxury designer shoes, and more! Could you indicate me the pattern color (number) of the double breasted plaid suit in the picture ? Hi John, Unfortunately this grey/blue color is currently out of stock. However on our site, the same pattern can be found in No.51013-4 and No.51013-2. Our apologies. You can feel free to shop other patterns and or design now right here: http://www.itailor.com/designsuits please let us know if you have any further questions. Thank you. Thank you very much for your answer. Would you then have the number corresponding to the pattern of the striped double breasted suit on the third model ? Hi John, certainly, No. 51020-2. Great write up. I did write an article each on the resurgence of the burgundy colored suit and the unstructured men suits. Whats your take on it. Hi can you give me the number to the light blue and pink 3 piece with the solid vest? I was wondering how to create a double breasted waistcoat like shown in the three-piece suit picture as I have been unable to create a double breasted waistcoat on your website? Interested in the number 4 plaid double breasted. How would I order this suite.